Share happiness with someone special! Crafted by the renowned artist Susan Lordi, for Willow Tree®, our “Good Cheer” figurine is a unique and special keepsake your recipient will treasure for years to come. This beautiful statuette of a woman cradling an oversized bouquet of sunny yellow roses—symbolizing friendship, optimism and well-being—makes a wonderful gift for friends who have achieved a goal, need a little lift… or for those who simply brighten our day! 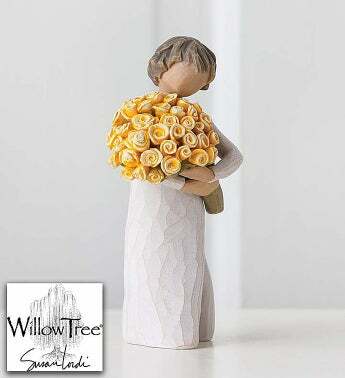 Created by artist Susan Lordi, Willow Tree® is an intimate, personal line of figurative sculptures representing qualities and sentiments that help us feel close to others, heal wounds or treasure relationships. The sculptures are rendered so as to suggest elegance, simplicity, peace and serenity.